It's been about five months since the winter holidays, which means all those tiny and adorable puppies and kittens who were given out as gifts have gotten a lot bigger and older - and some families are realizing that they weren't prepared for the commitment of having a pet. The Lowndes County Animal Shelter in Valdosta, Georgia, is completely full - brimming over with both the new spring litters and the older puppies and kittens, who were given as holiday presents and are now being returned. "It's really a sad time of year at the shelter," Lowndes County Animal Shelter's Paige Dukes told local news outlet WCTV. Unfortunately this phenomenon isn't just happening in Lowndes County. Pets given as holiday presents are showing up at shelters across the country. "It's certainly something that we do experience," Rob Halpin, director of public relations at Boston's MSPCA, told The Dodo. "There's especially a risk of it happening when the recipient doesn't know they're getting an animal." 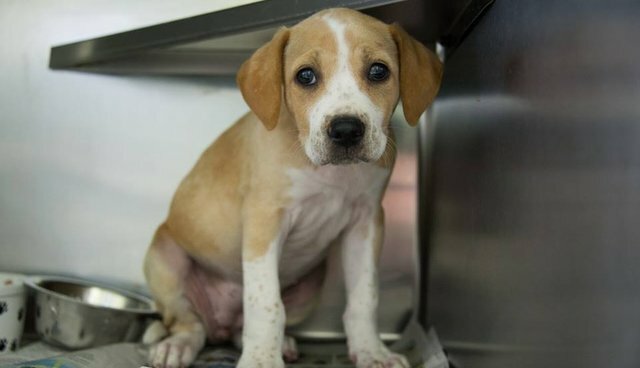 "The puppy that was 8 weeks old around Christmas is now at that teenage stage," Dana Rocco, shelter manager at the New Rochelle Humane Society in New York told The Dodo, "and it may be more than what people were expecting." When animals are offered as gifts to unsuspecting family members, there's no time to meet the new puppy or kitten to make sure personalities match up, or to discuss who in the family will take on responsibility for walking and feeding. "It's like arranging a blind date for somebody," Rocco explained, "If someone is coming in wanting to adopt for someone else, we won't do an adoption." "We're not opposed to the notion of adding a pet to the family during the holidays," Halpin told The Dodo. "But that's not the same thing as giving a pet as a surprise ... it's never a good idea to surprise someone with a pet." During the excitement of the holidays it's easy to forget that adding a pet to the family is a major commitment, one that requires careful planning and lots of preparation. But taking the time to find the right pet to join the family means fewer heartbroken dogs and cats showing up at shelters a few months later. For information about the pets up for adoption at the crowded Lowndes County Animal Shelter, visit this volunteer-run Facebook page.